Garvey Returns is something you should read. 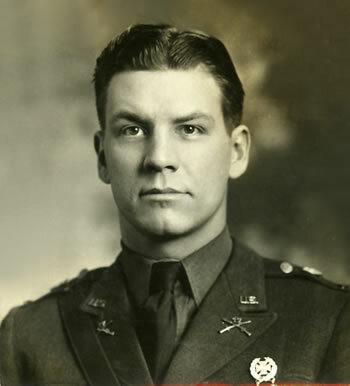 Lieutenant Dale M. Garvey took command of Co. 4726 on June 2, returning to American Island after two and one-half months absence during which time he served as junior officer at the Columbia, S. Dak., CCC camp. 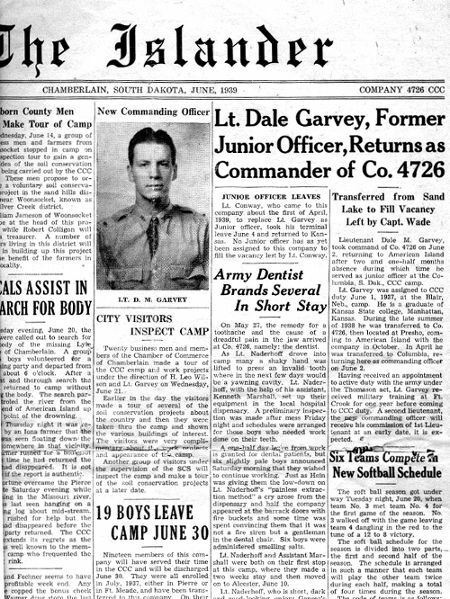 Lt. Garvey was assigned to CCC duty June 1, 1937, at the Blair, Neb., camp. He is a graduate of Kansas State college, Manhattan, Kansas . During the late summer of 1938 he was transferred to Co. 4726, then located at Presho, coming to American Island with the company in October. In April he was transferred to Columbia, returning here as commanding officer on June 2. Having received an appointment to active duty with the army under the Thomason act*, Lt. Garvey received military training at Ft. Crook for one year before coming to CCC duty. A second lieutenant, the new commanding officer will receive his commission of 1st Lieutenant as an early date, it is expected. *The Thomason Act gave permanent regular Army commissions to qualified reserve officers. During World War II, these officers were known as "Tommies."